After this weekend, the Boston University softball team can add one more Turnpike Trophy to the athletic offices on Babcock Street. The Terriers (25-17, 7-2 Patriot League) made quick work of the College of the Holy Cross on Friday and Saturday in Worcester, sweeping the Crusaders (8-24, 2-7 Patriot League) in three consecutive games to move into first place in the Patriot League. The Terriers shut down Holy Cross for a 5-0 win Friday afternoon before activating the bats for 9-4 and 6-3 victories in a doubleheader Saturday afternoon. Freshman Ali Dubois was the winning pitcher in all three games to improve her record to 18-6 and was named the Turnpike Trophy MVP. The Torrington, Connecticut native spun a complete game shutout in game one on Friday, striking out eight Holy Cross batters while allowing just four hits and one walk. Saturday’s first start was almost equally as dominant. 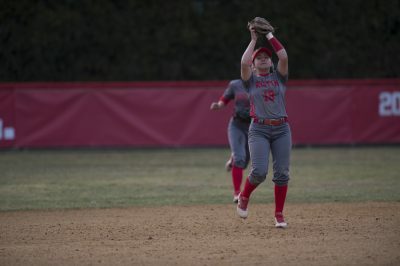 Dubois fanned seven in five innings of work, with the only hit she yielded being a two RBI single by Holy Cross senior catcher Savannah Young in the fourth inning. But the freshman had the stamina to head out to the circle once again in the finale. There, she brought similar intensity, going the distance while surrendering three runs (two earned) on five hits and three walks while striking out an astounding 13. Over the series, Dubois struck out a total of 28 batters, with 20 in the doubleheader alone. Dubois was also helped out by some boisterous bats. In Friday’s tilt, senior infielder and outfielder Jilee Schanda continued her recent surge, going 3-for-3 at the plate with three runs and one walk. Schanda scored the first two runs of the contest for the Terriers, coming around to score on an RBI double by junior catcher and infielder Alexa Ponce in the second inning before crossing home on an RBI fielder’s choice from senior infielder Kaitlin Sahlinger in the fourth inning. Junior infielder Emily Morrow knocked in two runs on two hits while classmate junior infielder Madi Killebrew garnered a run and two base knocks of her own as BU earned a 5-0 shutout. The Terriers also jumped out to a large lead in the second game of the series, leading 7-0 after the top of the fourth inning. A four-run third inning was the key for BU. Senior infielder Brittany Younan began the stanza with a single before advancing to second on a stolen base and third on a groundout. Younan then increased the Terriers’ lead to 2-0 after junior catcher Alex Heinen reached base on an error by freshman infielder Bella Jankowski. After a Killebrew flyout, the avalanche hit the Crusaders. Schanda doubled to left center to plate Heinen, and after a Ponce walk, Morrow tripled down the foul line in right field to score both baserunners to highlight a 2-for-3 day at the plate. In the final game, the Terriers were faced with some adversity. After a solo home run by senior outfielder and utility player Gabby Muniz in the second inning, Holy Cross grappled hold of a 2-1 lead. BU did not panic, responding with another four-run third inning, which mirrored the previous game. With one out, Younan and Wong singled, each stealing a base to put two runners in scoring position. Younan then crossed home on an error by sophomore infielder Sydney Behrens, which allowed Heinen to reach first. A Killebrew RBI groundout gave the Terriers a 3-2 lead, and subsequent RBIs by Schanda, who went 2-for-3 with two runs and an RBI, and Ponce furthered the margin to 5-2 after the third to propel BU to a 6-3 win.